Excellent article. I have 1/2" A36 stock, saved me $80. I'd purchased a piece of scrap steel this week for the same reason. Scrubbed it with Comet, washed with soap and water, and then ran it through the dishwasher. It still didn't look clean; when I found your post I did what you suggested. After just 20 minutes I'm amazed at what's coming off of the sheet. 1) I'm about to get a steel myself after years of working on tiles/stones. Do you have any reason to have concerns about lead in A36 steel or any evidence that explains why I *shouldn't* be concerned about lead transferring to food? 3) I'm trying to make good New York style as without the wood and without the temp there's no duplicating Neopolitan. Someday: wood burning oven in back yard!! 1. I have no knowledge as to why you should or shouldn't be concerned about lead in A36 steel. 2. Thanks but I figured out my challenge! I found switching to mass based measurements helped a ton. There is not any lead in steel. It is made from iron. Thank you for posting this. Being in Canada, the cost would be even higher to purchase a pre-made baking steel and have it shipped here from the USA. I'm having the metal cut now and will be following your instructions. So happy to find your blog! Purchased a 14 x 19 piece of A36 3/8" steel for $26 CDN. Rounded the corners with a plasma cutter and used a grinding disk to smooth & sand the entire piece clean, so no vinegar soak was necessary. The seasoning instruction are great and the baking steel looks perfect! This weekend I'll be baking lots of bread. Thank you! Sandra, would you be able to share with me where you bought your piece of steel from? I'm located in Toronto and this would save me some research on where to get a piece! Koz, can your steel plate be used on a stove top, too? I got a quote on a 16" x 18" x 1/2" plate for $136 Canadian (rounded corners and cleaned.) is there a reason you chose your particular dimension? Thanks for your help. You can! They make a very heavy duty griddle too! I picked the size because it was bigger than the pizzas that I make. The size gave me room to work without crowding. Hi Sandra. So happy to have found someone in Canada who found the steel sheet. I've been going around to find A36 steel but was unsuccessful. Would you kindly direct me to the right place. A36 steel is US the equivalent in Canada is 44W. hi Sandra where were you able to get this steel in Canada. I’m beginning to think of going the DIY route myself. I’m in the Toronto GTA area. Thanks for the tips. Any idea if I can use this on the gas stovetop as well like the baking steel griddle? do you think that having more than one baking steel ie. 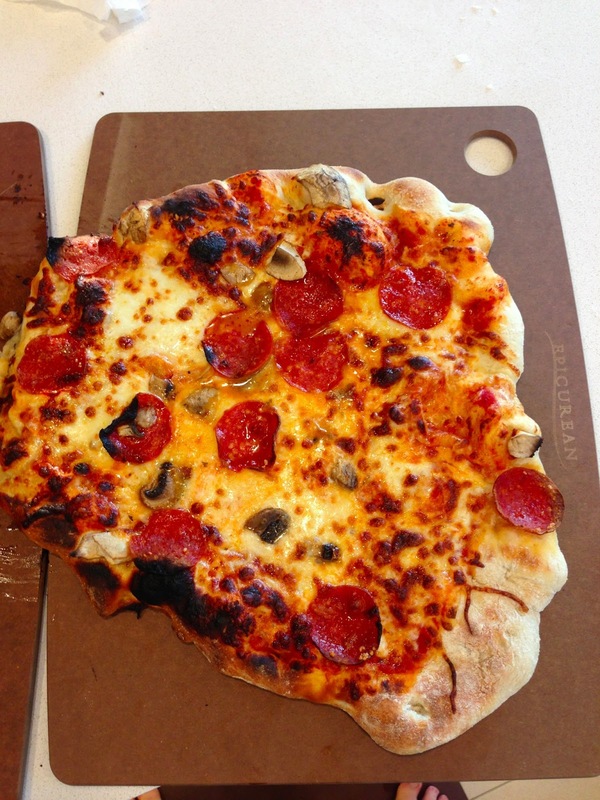 having a baking steel on each rack of the oven would work so that each pizza would receive heat from top and bottom. thinking out loud commercially. I don’t think so. I think the reality is that you need the direct heat of the broiler to get the steel hot enough. The bottom one just won’t get the same impact. You inspired me to seek out a baking steel! Thanks for the instructions! You inspired me to seek out a piece of steel! Thank you for the great instructions. The first pizza will be baked in your honor. Thanks for the inspiration! Have my two pieces of steel soaking right now. For me, DIY adds a "coolness" factor that lends immeasurable satisfaction to the process. I used your plan. I found a local recycling center that also sells new steel. I bought a 16X18" torch cut (hot rolled steel) for under 15.00. I have a grinder etc. 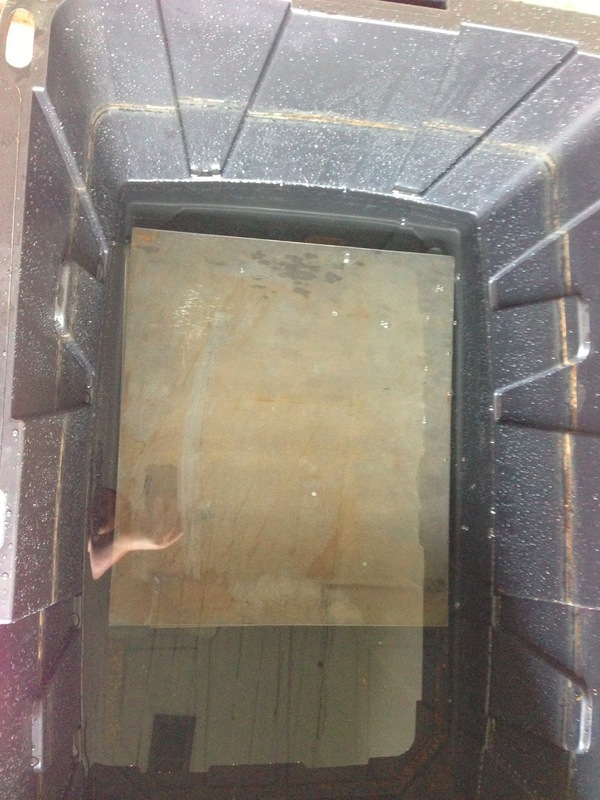 I only put the steel in the vinegar bath for 24 hours and the mill scale was all gone. I didn't use soda, however, I did use a sander (after grinding the edges smooth) on the surface just to clean it up. I used 40 grit with a palm sander and finished with 220. The steel has a polished quality to it. It's now in the oven for it's first seasoning. Thanks for the information. I have a 16X18" steel for under 20 bucks. I used your plan and it turned out great. I found new steel at a local steel recycling center. I bought a 16X18" .25" A-36 piece that was torch cut for less than 15.00. I have a grinder/sander so did my own edge work after soaking the steel in vinegar for 24 hours. Hose it off, you don't need soda as it's a mild acid. I did sand the surface of mine to polish it. It's in the oven for it's first seasoning. Will be interesting to see how it works for pizza. Again, thanks for the info. I got a 16X18" steel for under 20 bucks including the gas to go get it, etc. (I wanted a little larger surface to be able to bake 2 loaves of artisan bread at a time). What do you think about using aluminum sheet, similar dimensions? I don’t know the answer to your question. The specific heat capacity of aluminum is nearly twice that of steel. It will probably work! I put the steel in the oven and now there’s rust on both of them. They’re dry but rusty. What do I do now? First, loved the post. Just made some of my best pizza ever! For the aluminum, remember that the density is about a third, so much less mass to hold onto the heat. I would also imagine the thermal conductivity is much less than A36, so slower to transfer heat to the crust. For those looking for where to buy A36 plate in Toronto, I used the Metal Supermarket. Why is the steel in the bottom right photo with the caption “Round is overrated” different to the rest of the steels in your pictures? It seems to be engraved and has a hole in one of the corners, none of the other steels look like that. My brother is building one for me, but against my request, purchased a 3/8 stainless plate instead of A36 Steel. I realize that it’s less than a third the conductivity, but mass/thermal mass are about the same. I know over a stove that stainless heats unevenly, (hence being clad with alumnimum and/or copper), but in oven where it can heat evenly, will this reduced conductivity noticeably impact the browning of the pizza? do i need anything else to remove it rather than 2 day in vinegar ? I have a question, I’m new at baking anything and I need a lot to learn. Would my pizza get stuck to the steel pan? I’ve had other experiences where my food gets stuck to steel pan on stove top. Also would it be a good idea to use the steel for bread baking? I don’t find my pizza gets stuck to the steel. I use a metal peel and move quickly and it comes off fast. A steel is great for baking bread!